We tend to think of pirates as keeping parrots, but monkeys are arguably just as iconic, especially after Geoffrey Rush’s turn in Pirates of the Caribbean. Since Kaladesh also has a lot of Indian influence in its names and visual style, it also makes sense that Kari Zev would have a monkey, considering their prominence in India’s biosphere and mythology. Even if she were just a stylish marquee card for pirates and a foreshadowing of Ixalan, that would be pretty cool by itself. However, Kari Zev is also a surprisingly effective card. The sorts of red decks that want to play low-cost creatures don’t usually want ones with higher toughness than power, but it’s tempting to make an exception when the creature is as hard to block as she is. Since it takes at least three blockers to stop all the damage she represents, not everyone is going to risk losing any in the process, and you can only afford let so much damage through against a red deck before you’re in the danger zone. Kari Zev is a pretty decent card overall. She’s not amazing, but she offers nice little synergies that make her a resilient attacker and continued source of advantage. First, she has first strike and menace on a 1/3 body. This makes it harder to just chump-block her with a bunch of X/1 creatures, since she’ll kill one and potentially live anyways. 1 power makes her more of an early threat, but 2 mana cards oft shine brightest early. But her real advantage is that she effectively brings 3 power to the board each combat, summoning her monkey friend Ragavan to mess things up. Even if he dies, he comes back anew the next turn; she’s effectively a 3/4 split over two bodies, which helps red establish an early tempo advantage that can be hard to stifle. Also, she’s a Pirate, which is more relevant in Ixalan with the added Pirate synergies. 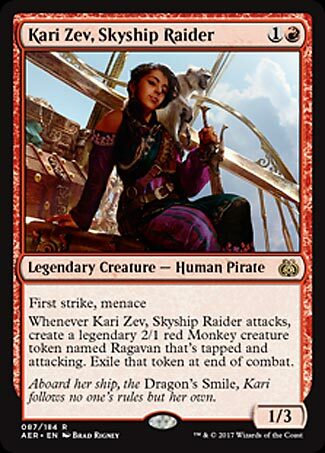 She’s not an all-star, but Kari Zev is a pretty nice card with a custom-made home in a Pirate deck (and use in red decks otherwise). Definitely worth a look.